Champions! 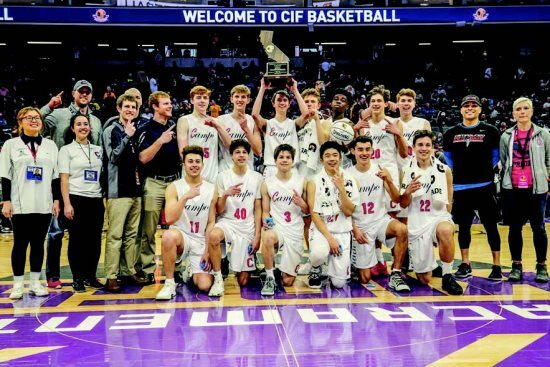 Utilizing a consistent offense and a smothering defense, the Campolindo boys high school basketball team claimed the State Championship at the Golden 1 Center in Sacramento by defeating Colony High School (Ontario) by a score of 55-40. This was the second time that the Cougars played in the state finals, having lost to Damien High School in 2015. Coming into the season Campolindo head coach Steven Dyer made it be known to his players that they were going to be a better defensive team: "I'm a defensive coach. These guys knew that if they wanted to play, they were going to have to play hard defensively and we continually improved our defense throughout the year. It was exciting to finish the season with our three best efforts." The numbers speak for themselves - Campolindo held Grant High School to 23 points under their season average, Serra to 22 points under their season average and Colony to 32 points below their season average. A team can only achieve that kind of defensive excellence by having every player on the team playing hard and selling out every minute they are on the court. 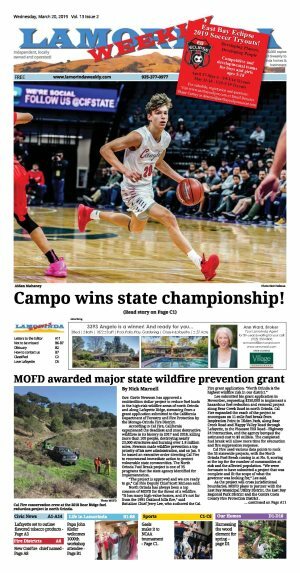 Campolindo did that and that is why they are the state champs. Dyer cited the players' defensive efforts both individually and as a team: "They followed the game plan and watched a lot of film to get ready. Everyone did their part." 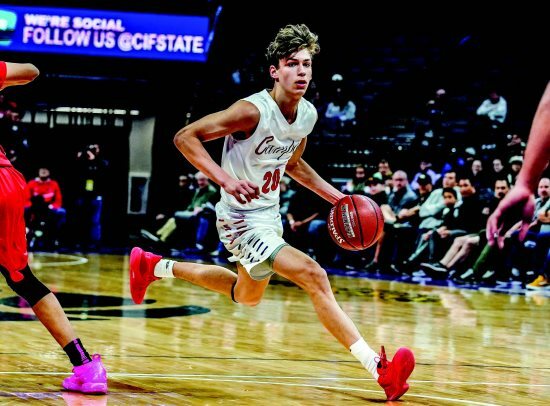 Carter Mahaney was assigned to Colony's top scorer, Sedric Altman, who scored 28 points but only connected on 10 of his 24 shots. "Carter made him work for everything," Dyer said. The rest of the Colony team scored 12 points, shooting a combined 29.6 percent. Also key for Campolindo was how they outrebounded Colony 37 to 28, limiting Colony to only seven offensive rebounds. Added Dyer: "We really focused this year on rebounding. If we're even or win the rebound battle, we'll usually win the game. It's a collective effort, including the guards that really helped on the boards." Campolindo's offense was led by freshman Aiden Mahaney and sophomore Emmanuel Callas, both scoring 19 points. Though averaging five points a game, the 6'4" Callas was expected to be a key factor on offense, said Carter Mahaney: "We knew that he had a size advantage inside and we went to Emmanuel and he was great tonight." Callas gave much of the credit to his teammates: "It was just a matter of getting to the right spot and they got me the ball and I was able to finish the play." Aiden Mahaney, who shot 7 for 10 from the field, stayed focused all game: "He's obviously not afraid of the big stage," said Dyer. Colony coach Jerry De Fabiis concurred: "It's obvious he has a very high basketball IQ and he's not scared of the moment." In the fourth quarter, Colony tried with little success to full court press Campolindo. "They are a good pressing team that was able to take other teams out of their offense," said senior David Ahazie, "but Carter and Aiden are elite ball handlers and we never really worry when teams try to press us." The chemistry between Aiden and himself was a key, said Carter: "We know each other's game and feed off each other very well. We prepped for their trapping and watched a lot of film. We knew if we cut hard and made strong passes, players would be open." The Cougars maintained their composure throughout the game, answering every attempt by Colony to close the gap. Dyer planned for this from the beginning of the season: "We played a very good nonleague schedule and it prepared us to fight through any adversity that came at us. Our guys did a really good job in just playing the next play and not getting fazed." Evidencing their consistency over the last three games, the Cougars outscored their opponents in nine straight quarters by an average of 4.5 points each period. 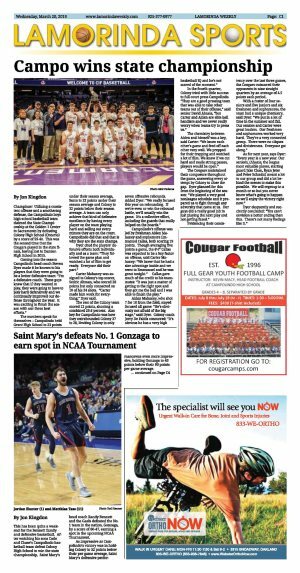 With a roster of four seniors and five juniors and six freshmen and sophomores, the team had a unique chemistry, said Dyer: "We put in a lot of time in the summer and fall. Our seniors and Carter were great leaders. Our freshmen and sophomores worked very hard. They're a very connected group. There were no cliques and divisiveness. Everyone got along." As for next year, says Dyer: "Every year is a new year. Our seniors, (Ahazie, the league most valuable player, starting guard Jake Chan, Ryan Jeter and Peter Schmitz) meant a lot to our group and did a lot behind the scenes to make this possible. We will regroup in a month or so but you never know what's going to happen so we'll enjoy the victory right now." Dyer eloquently and succinctly concluded: "You can't envision a better ending than this. There's not many feelings like it."